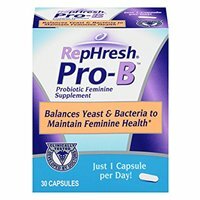 At 3 out of 5 stars, I think RepHresh Pro-B Probiotic is a slightly above average probiotic supplement. There are a number of things that I really like in this product. 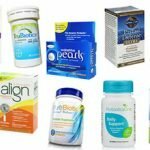 This supplement is uniquely geared towards women and overall feminine care. I thought this was interesting because I have yet to try a probiotic that was designed specifically for balancing the body’s yeast and bacteria levels. Balancing these levels is especially important when maintaining a normal, healthy range of vaginal flora. I love the ease of use and convenience of this probiotic. 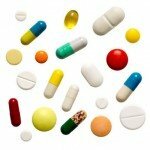 The directions say to take 1 capsule daily (super simple) and the capsules themselves are extremely easy to swallow and they are very small. I also like the container with a flip top that the capsules come in. It reminds me of the old film canisters and is very compact and easy to travel with and doesn’t take up space. You don’t have to refrigerate these capsules, which makes it convenient and more stable but be sure to use the bottle up within 90 days of opening. There are definitely areas that I like about this probiotic, but there are also some things that I don’t like. My biggest issue with this product is that it contains MILK and GELATIN. This makes this product not allergy friendly because so many individuals suffer from these allergies. RepHresh doesn’t have a money back guarantee and the live cells are only certain at the time of manufacture. 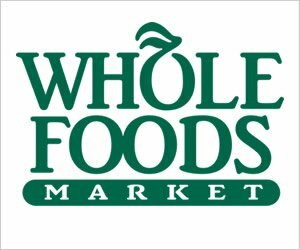 So overall, I gave this product a 2.75 out of 5 stars because I like that it is uniquely designed for feminine care, easy to use, and convenient but I don’t like that it contains MILK and doesn’t have a guarantee. RepHresh Pro-B Probiotic has 5 billion cells in 2 different probiotic strains. I like the first strain, Lactobacillus Rhamnosus GR-1, because it has been shown to have a plethora of potential benefits. Some of the possible effects from taking Lactobacillus Rhamnosus are relief from diarrhea, protection against respiratory tract infections, promotion of urogenital health, and help treat eczema. This strain may also help ease anxiety in some individuals and may help increase weight loss in women who are already dieting. The second strain used in RepHresh Pro-B is Lactobacillus Reuteri RC-14. Lactobacillus Reuteri has been shown to potentially help protect against harmful pathogens, boost oral health, and balance the yeast and bacteria levels in the body. This strain may also be helpful in the treatment of urinary tract infections, relieving bouts of diarrhea, and overall intestinal health. RepHresh Pro-B Probiotic contains MILK and GELATIN. This makes this probiotic not allergy friendly. Other added ingredients in this product include: Dextrose anhydrate, potato starch, microcrystalline cellulose, magnesium stearate, and titanium dioxide. The cost for a bottle of 30 capsules equals $17.96. When you break that down to a daily cost, it ends up being $0.59. RepHresh Pro-B Probiotic falls right in line with the average going rate for daily probiotics. I think the price of this product lines up well with the value of it. I didn’t experience any side effects while taking RepHresh Pro-B. This probiotic contains 5 billion cells, which is on the gentler side and may be why I was good to go while taking them from the start. I didn’t see a satisfaction or money back guarantee for RepHresh Pro-B Probiotic. This is a let down because I like when a company can offer a guarantee for the consumer. 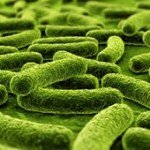 To buy RepHresh Pro-B Probiotic, click here.